A full year since the release of her fifth LP, the well-received Okovi, Nika Roza Danilova (aka Zola Jesus) used the tail end of her ambitious world tour to visit cities that she's previously passed over, like Windsor, Halifax and the nation's capital. 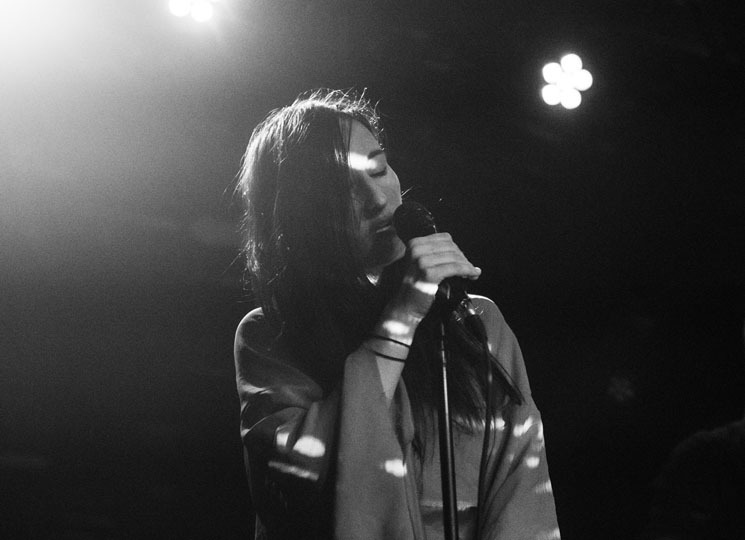 Appearing at Ottawa's 27 Club (formerly Zaphod Beebelbrox) Zola Jesus was joined by hometown musician Matt Radich, who performs a blend of synth pop and lo-fi indie rock under the moniker Townes. Gripping a sunburst Rickenbacker guitar, Townes gleefully mumbled lyrics overtop beats launched from a SamplePad, giving the crowd a half-hour opening set that straddled the line between brilliantly slapdash and gallingly clumsy. Decked in flowing red robes, Danilova introduced herself by crawling across the floor of the club's spacious stage — adorned only by an impossibly-packed pedal rack and her tour guitarist Alex DeGroot — to grip the microphone and brood through "Veka," from her latest LP. Receiving an enthusiastic response, Danilova fed off the energy of the half-full club, ripping through another new track, "Soak," which found DeGroot pummeling the room with a dense noise assault. The poppy "Dangerous Days," from 2014's Taiga, found Danilova bouncing around the empty platform, pumping her arms in a gothic hip-hop stance. Fully breaking her sullen character, Danilova addressed the receptive audience with a laid-back and sociable demeanour, sharing her fears that no one was going to show up to the show and even cracking a few jokes. Moving into the touching "Witness," Danilova quickly drew the crowd back into her theatrical stage show, explaining that the song was written for a family member who attempted suicide. Missing her viola player, Michelle Woodward and without a traditional light show — while relying heavily on pre-programmed beats coming from a laptop strangely situated on the stage floor — Danilova managed to mesmerize the crowd by slinking around the stage to perform even more tracks from Okovi. Ending her too-short hour-long set with a pair of older tracks, "Night" and "Vessel," Danilova turned "Exhumed" into an all-out spectacle, whipping her body across the stage in a possessed state before venturing into the crowd to kneel on the floor and sing the song's final verse. Returning with a single song encore, "Skin," from 2011's Conatus, Zola Jesus left the Ottawa crowd with a captivating performance that managed to feel intimate, colossal, and captivating.